Unique colour and extremely durable flowers. 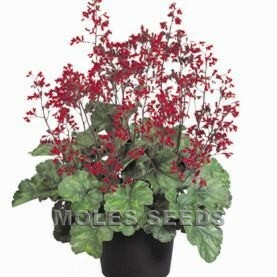 Attractive contrast between the deep red flowers, which are densely packed along erect flower spikes and the compact wintergreen leaf cushions. 40cm. Perennial, 3-4 weeks at 20°C; sow April-July. 24,000 seeds per gram. Sell in: 9cm to 2 litre pots, as green plant with label.